How much do doctors get drug companies? 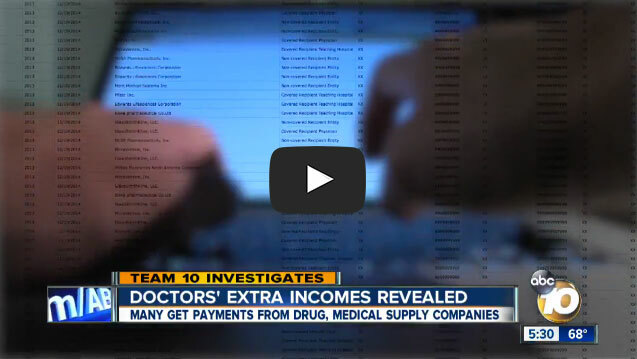 May 11, 2015 – San Diego doctors earn hundreds of thousands of dollars from prescription drug and medical device companies, and now those lucrative financial relationships have gone public. A little-known provision of the Affordable Care Act requires payments made to doctors by companies must now be reported so that patients can make better decisions about their health care. Team 10 checked the website https://openpaymentsdata.cms.gov and found several San Diego doctors making a good living outside of their regular practices. One made almost $140,000 in a five-month period; another got a single payment of $19,000 classified as a "gift." Dr. Charles Rosen, a spine surgeon from Irvine who co-founded the nonprofit Association for Medical Ethics, told Team 10 the new rules -- referred to as "The Sunshine Act" -- were created for the small percentage of doctors who may be getting kickbacks from drug and medical supply companies. "We're talking about really maybe 5 percent of doctors that have really sold their souls to industry and they'll say whatever they are told to say and sell whatever they're supposed to sell, and will get involved in physician owned distributorships," said Rosen. "There were a couple of doctors that when the Sunshine Act passed, they moved to other countries." Rosen says 95 percent of doctors in this country want to do the right thing for their patients. Very few, he said, would knowingly do anything illegal. Many of the payments to doctors are classified as consulting fees and honoraria for speaking at conferences and teaching about new procedures or medications. Some list travel, meals and lodging associated with those conferences. All payments are itemized, and the names of the companies that paid those fees are also listed. Rosen said doctors who help develop and test products to improve health care are doing nothing wrong or illegal, but said it's important that patients have access to the information so they can be informed consumers. Team 10 found several San Diego doctors making substantial amounts over the first reporting period, which covers the last five months of 2013. Dr. Robert Weinreb, an ophthalmologist with UCSD, made $107,964.36. Much of that money was paid by Alcon Laboratories for consulting. Alcon makes contact lenses and other products related to eye health. Weinreb traveled to Texas for Alcon, and to Rio de Janeiro to consult for Allergan, Inc.
Dr. Maged "Samy" Abdou, a neurosurgeon at Kaiser, made $105,534.82. A spokesperson from Kaiser said the payments were related to a patent sold to NuVasive by the doctor, who has a total of 45 patents to his credit. "There is no conflict of interest," said the spokesperson. Dr. Choll Kim, who specializes in minimally invasive spine surgery, made $137, 249.81. Most of that money came in the form of consulting fees for Globus Medical, a company that Kim said is on the leading edge of innovation when it comes to minimally-invasive spine surgery. Kim told Team 10 he uses a lot of the Globus devices because he helped design them. "I think it helps my patients because it allows me to use instruments and techniques that allow me to do surgery more effectively through smaller incisions," he said. Kim said he believes transparency is important, and that if patients have concerns about the payments he receives they should feel free to ask him relevant questions. When asked if he thought some patients might consider the payments a conflict of interest, he answered, "I think they should have the information so they can independently make that determination." Orthopedic surgeon Yu-Po Lee of UCSD earned $29,952.68 on top of his salary. He told Team 10 he takes pride in helping train doctors so they don't "practice" on patients but have enough experience to give the best care possible. Lee pointed out that he has no say in the implants he uses at UCSD because the teaching hospital has contracts with various companies to keep costs down. Lee said the transparency required by the Sunshine Act is good for both doctors and their patients. "Now patients can actually see if there are any inappropriate relationships, but also they now have access to all of their charts so they know exactly what we’re saying about them and what our plans are for them, so I think everything about transparency is important," said Lee. Rosen encouraged all patients to give their doctors a check-up, by looking them up and asking questions if there's anything they see that might indicate a conflict of interest. "It should lead to more openness and more transparency and more discussion, which is sort of a cleansing factor in and of itself for some of these problems," Rosen added. The Association for Medical Ethics began tracking payments to doctors several years before the federal government. To check your doctor's past track record, you can go towww.ethicaldoctor.org and click on Physician Industry Payments.